The wind did not fill in until 6 hours after the expected start today at the European Match Race Championship. 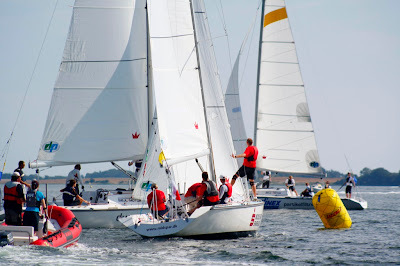 The sailors "camped" all over the break water pier in Middelfart to wait for for the wind build up. To the tunes of Bob Marley and others the sailors spended their time on playing fooseball, drinking coffee and playing in and nearby the water. "Unfortunately this is just part of sailing. There is nothing anybody can do about it. We´ll just have to wait", said Regatta Chairman Søren Laugesen. 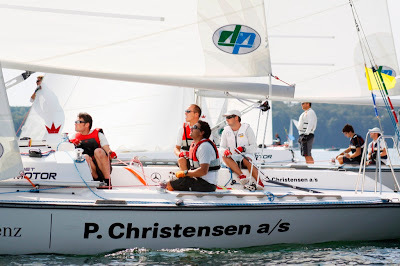 Danish skipper, Mads Ebler, was not too excited about the situation. "The weather was nice for sure. But I would much rather prefer more wind so we can sail", he said. Mads Ebler got one race in today where he beat Englands Ali Hall. The forecast for tomorrow promise more sunshine and slightly more breeze. Fingers are crossed. Today's update: Everybody looks happy at Middelfart Marina this morning. After a 6 hours postponement yesterday and only 5 flights finished this mornings conditions looks very promising. The sun is out and the temperature is rising steadily and at the breeze is now up to 8 knots from a southern direction.